Supreme Court Term Begins In The Shadow Of Kavanaugh Confirmation Battle For now, the court will be evenly divided between conservative and liberal justices. In the next week, the Court will hear cases involving endangered species, the death penalty and immigration law. 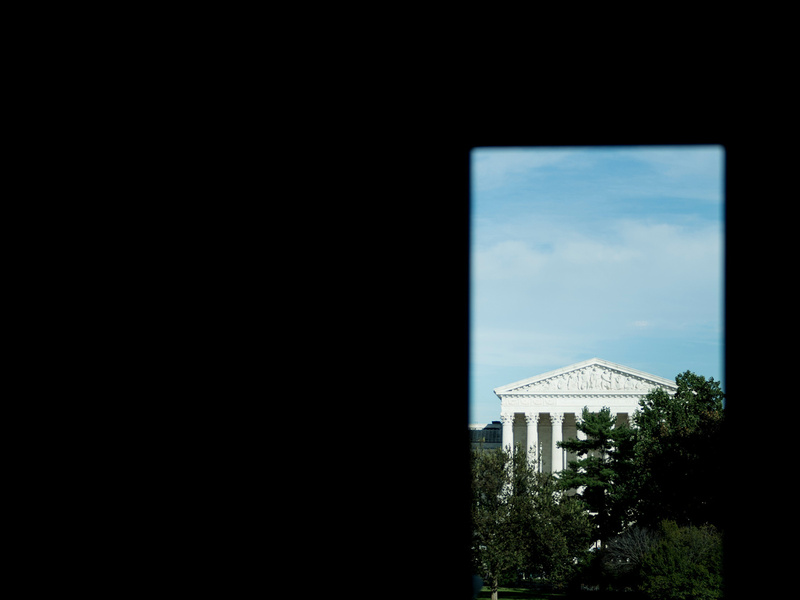 A view of the Supreme Court from Capitol Hill September 28, 2018. The Court begins its new term on Monday one justice short while the Senate remains stuck in a confirmation fight over Judge Brett Kavanaugh, who's been accused of sexual assault. As the Senate remains in a pitched battle over the nomination of Brett Kavanaugh, the Supreme Court on Monday will begin its new term with far less fanfare. The high court is launching its nine-month term evenly divided — with four conservative and four liberal justices — as an F.B.I. investigation into sexual misconduct allegations lodged against Kavanaugh delays a full Senate vote on the nomination. Kavanaugh was nominated to fill the vacancy created by the retirement this past summer of Justice Anthony Kennedy, who often cast the pivotal swing vote on cases. Republicans Push Kavanaugh Nomination Forward, But At What Cost? Whereas last term the high court decided several landmark cases with 5-4 decisions, such as Trump's travel ban, limitations on how public-sector unions can collect fees and the privacy rights of cellphone users, for now there are fewer high-profile cases awaiting the justices this fall. Here's a look at some of the upcoming cases that might be considered by an evenly-divided Supreme Court. The very first case the Court will take up concerns a frog species that is threatened with extinction: the dusky gopher frog. Weyerhaeuser., a large timber company, is challenging the federal government's classification of Louisiana timberland as a "critical habitat" for the dusky gophers. There are only 75 dusky gopher frogs left in the wild and they are protected by the Endangered Species Act. Lawyers for Weyerhaeuser argue that a parcel of Louisiana land should not be considered a habitat for the frogs, since they don't even live there yet. The U.S. Fish and Wildlife Service says the only way to save the frog is to relocate them to newly constructed ponds in pine forests throughout the South, like the one owned by Weyerhaeuser. On Tuesday, the justices will hear death penalty case involving Alabama death row inmate Vernon Madison. He has spent nearly half of his life awaiting execution after being convicted in the killing of an Alabama police officer who was responding to a domestic disturbance in the mid-1980s. Madison shot and killed the officer and also fired at his then-girlfriend, who survived the shooting. Advocates for Madison say he now suffers from dementia and cannot remember the fatal shooting that sent him to death row. About 30 minutes before Madison was supposed to be executed by lethal injection in January, the high court issued a temporary stay. The central question raised by the case is whether the state of Alabama would violate the Constitution's 8th Amendment ban on cruel and unusual punishment by executing a man whose dementia is so severe that he cannot recall committing any crimes. This case, scheduled for argument on Oct. 10, is about whether the federal government can detain immigrants awaiting deportation after finishing a prison sentence over a crime unrelated to their legal status. The Trump administration is appealing a lower court ruling that the White House says makes it more difficult to deport those in the country illegally. After an immigrant who is a convicted criminal finishes a a prison sentence and is released, the federal government cannot then re-apprehend that person and hold them indefinitely for possible deportation, the U.S. Court of Appeals for the 9th Circuit has ruled. Trump officials are appealing that decision. It is an important case to the Trump administration, which has pursued a hard line policy on immigration. Meanwhile, lawyers for the American Civil Liberties Union counter that allowing the indefinite detentions without a bond hearing would encourage "arbitrary detention." It is the second immigrant detention case the court has taken up in recent months. In February, the court ruled that immigrants held in detention — sometimes for years — are not entitled to a bail hearing, where they could win their release. It was a win for the Trump administration and it overturned a lower court ruling.